when is the Fun Run? The Fun Run will take place on Saturday, June 1st. Registration begins at 7am and the Run starts at 7:30am, rain or shine. In case of severe storms, we will postpone/cancel the Run. Where is the Fun Run? Vienna Community Center- 120 Cherry Street SE. It’s as long or as short as you want it to be. Just be back by 8:30am for the refreshments, music, and raffle drawings! is the fun run a fundraiser for braws? Yes! Money raised from the Run will be used to support our mission to bring dignity and empowerment to women and girls by providing menstrual supplies and undergarments to area shelters and schools. You can register online HERE or in person at the race. Please arrive close to 7am if you need to register. We accept cash, credit or checks. are you accepting donations at the fun run? Yes!! We will have a donation box for NEW bras (especially SPORTS BRAS! ), underwear or menstrual products at the run. I’m interested in volunteering, sponsoring or contributing an item to the raffle. Who should I contact? You are BRAWsome! 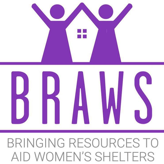 Please contact jennifer@braws.org Thank you! do you have to run to participate? NO! you can walk or run at whatever pace you like- just make sure to be back by 8:30 for the refreshments, music and raffle drawings! 7:05 am - Drop off your pads, new sport bras &underwear and get ready! 7:10 am - Enjoy time meeting other BRAWS supporters! 7:15 Check out all the raffle prizes and put your tickets in to win! 7:20 am - Warm up! 7:25 am - BRAWS Founder, Holly Seibold, kick off the race! 9:00 am - Have a great Saturday!